There are trips that one dreams about, and trips that one never forgets. My trip to Baja to test the new BFGoodrich KO2 All-Terrain T/A tires falls into the latter category. I never before had the opportunity to rub elbows with Baja off-road legends and drive and co-drive roughly 300 miles of the legendary Baja 1000 off-road course, and most likely I never will again. BFGoodrich was so confident in their new all-terrain radials that they flew me and several other journalists to Baja to put the new tires to the test in the environment they were developed in. The tires survived what we threw at them without skipping a beat, and appeared to genuinely live up to the claims that the BFG marketing department laid out for us. BFGoodrich invented the all-terrain radial tire in the late 1970s, doing much of the development for the first-generation tire at Baja. BFG convinced legendary off-road racer Scoop Vessels to try their then-new all-terrain radial in the grueling 1977 Baja 1000 race. Vessels ended up winning his class in that race, and the BFGoodrich legend at Baja began. While Scoop was the first winner, he wasn’t the last – in the ensuing 39 years of racing at Baja – not just the 1000, but the Baja 500, Baja 250, and others – BFGoodrich tires have notched 80 overall wins, far more than any competing tire brand. After arrival, I was dropped off in the desert to get an orientation to the two vehicles I’d be driving over the next three days – both BC (Baja Challenge) cars and Ford Raptor pickups. We all know what Raptors look like, and how they drive, and they were bone stock other than safety and communication equipment (roll bars, racing seatbelts, and radio equipment), plus a set of BFGoodrich KO2 tires. I thought of the BC cars as life-size radio control buggies. 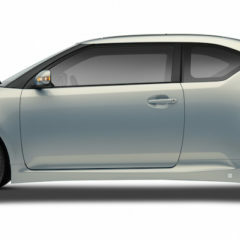 The BC cars are rear-engine, rear drive, powered by a Subaru-sourced flat-four attached to a four-speed manual gearbox. The BC cars are exactly the same cars that the BFG team raced in the 2013 Baja 1000 (and won with). 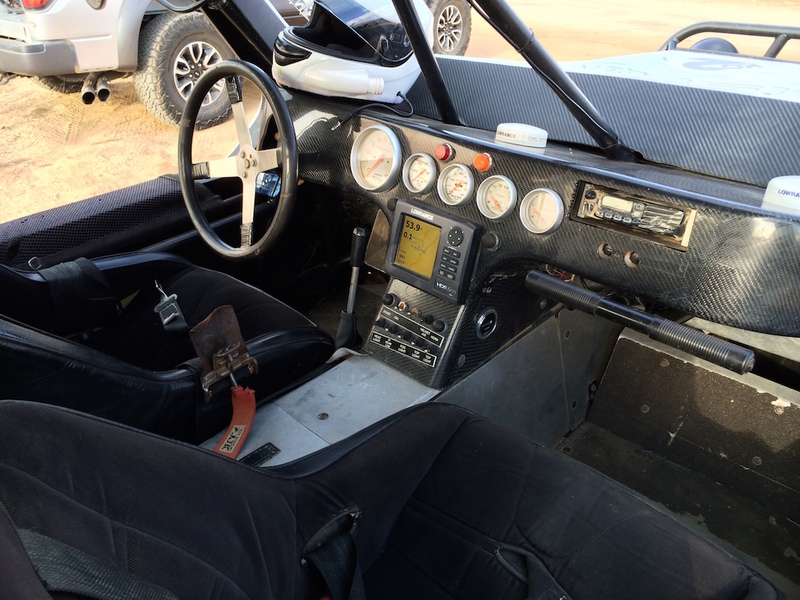 As you can imagine from a purpose-built off-road race car, the BC cars lack for comfort (they boast two “cup holders,” but lack windows, doors, a sealed floor, and a sealed cargo compartment). The only comfort items in the cars are padded seats and a fresh-air filtration system that connects to your helmet to keep your head cool and your visor fog-free. The cars are equipped with five-point belts (I was convinced that if we hit anything hard, the belt going between my legs would cause some serious reproductive system damage), and most importantly, BFGoodrich KO2 All-Terrain T/A tires. 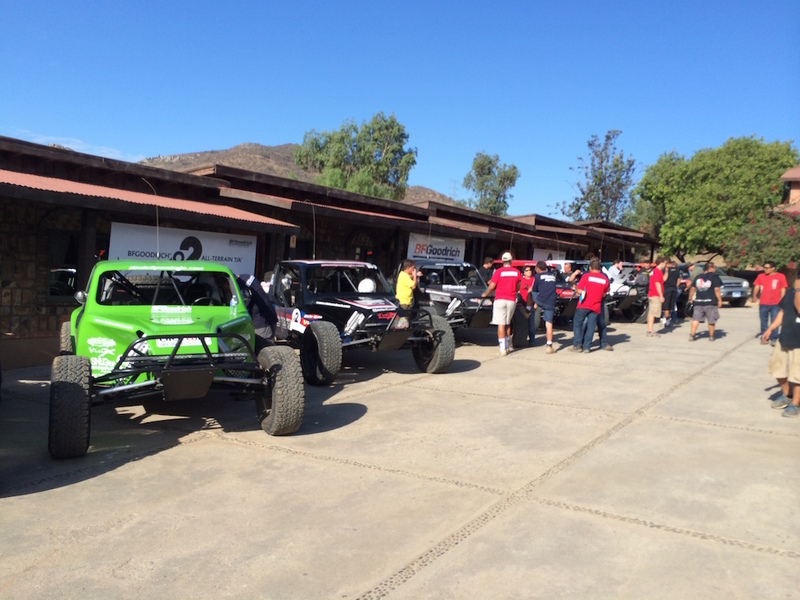 The tires on the cars are the identical model that won the Baja Challenge class in the 2013 Baja 1000. In fact, some of the chase cars used by staff members to coach members of the media had the actual tires that raced at Baja last November, still kicking after thousands of miles of off-road punishment. Upon my arrival, I received a media kit that had biographies of many of the BFGoodrich Performance Team members. I didn’t read the book until my last night in Mexico, but I wish I had a chance to earlier. My first night’s dinner, I sat next to a guy who introduced himself as Bryce. A very nice guy, very likable and down-to-earth, I later learned that Bryce Menzies happens to have been the 2014 Baja 500 overall winner in his unlimited trophy truck. Many of the other folks I rubbed elbows with are absolutely legendary in off-road and Baja circles. It was during this dinner that we received a briefing on the tires. The KO2’s development objectives, based on customer feedback, were treadwear, toughness, and traction, and the KO2 improves over its predecessor’s capabilities in all three areas. Though not entirely true, tire design is often a zero-sum game. If you want more traction, you’re often going to give up tread life with a softer compound. If you want longer tread life, you’re usually going to sacrifice some grip. All-terrain capability often comes at the expense of noise or on-road comfort. Yet somehow, the KO2’s engineers delivered more traction with better endurance. Some of the improved tread life comes from the rubber compound, which is a new mix developed for the KO2, but much of it comes from features in the shape of the tread and the design of the shoulders. Small triangular stone ejectors between the lugs on the tread throw away small stones that would otherwise dig into the tread and quickly wear it away. The result is a tire that lasts 15% longer on asphalt and twice as long on gravel (which is about the most abrasive, tread-killing surface a tire could travel on). Just as the KO2 relies on technology to improve its tread life, it also leans heavily on well-engineered features to improve traction. As you’ll read in a moment, we encountered conditions that really proved the tires’ worth. For instance, the serrated shoulder helps in snow and mud by providing traction on the tires’ sides and not just on the bottom as passenger car tires might. Mud-phobic bars on the sidewall literally eject mud from a spinning tire so there’s rubber clamoring for grip in the mud, and not mud-on-mud, which would doom you. 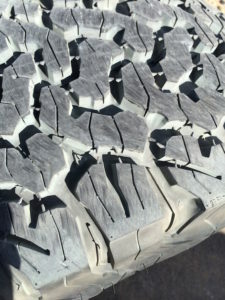 Finally, 3-D locking sipes (the “cuts” on the tread) are a winter-travel feature that manage to spread open when needed for traction but stay closed when not cutting through ice, preserving tread life. At Horsepower Ranch, we loaded our overnight bags (sealed in garbage bags to protect from mud) into the Baja Challenge cars. 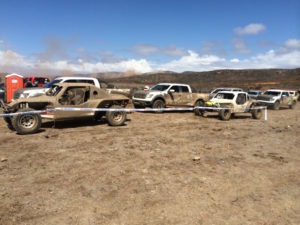 We then hit the trail in a caravan of seven cars – a guide car, four journalist cars with teams of two, a tail car, and a support car with mechanics. The boxer engines in the BC cars are not particularly strong, but the cars are also very light. What they lack in power and amenities, the BC cars make up for in personality and in suspension travel. The ride is bumpy and loud, which allows you to drive as much with your ears as with your eyes. 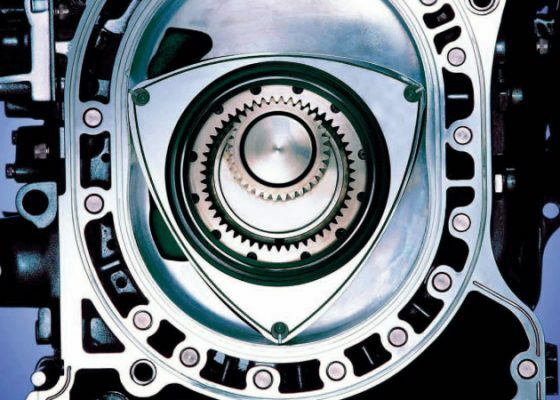 You know darn well what gear you’re in just from the timbre of the engine just behind your ears. My co-driver Thom Cannell and I quickly learned that the BC car is far more comfortable on dirt or gravel than it is on a paved road. 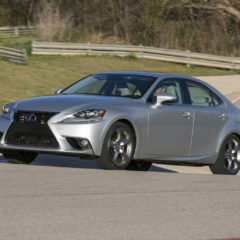 There is a ton of play in the power-assisted steering and it’s a challenge to keep the car in a straight line when traversing a few of the highway sections. 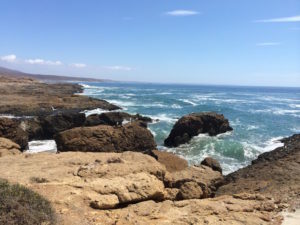 Our first few hours on the trails were mostly uneventful, but I was awe struck by the natural beauty of Baja. We were there to sample the tires, and they did a remarkable job on all the types of terrain – gravel, dirt, asphalt – that we threw at them. There were some very low speed sections over scary human head-sized rocks that the tires and BC cars shrugged their shoulders about and just ambled over them. As noted earlier, the BC cars are rear wheel drive only, but between the rear weight bias and the traction capability of the KO2 tires, we had no issues with dry traction on any type of surface. Because the cars are almost completely open – no windshield, doors, windows, or full floor – you learn very quickly to avoid mud puddles whenever possible. Shallower, slower puddles only get your feet wet and muddy through the open floor, but because there’s no windshield, we realized that a fast puddle entry meant a wave two seconds later that either hit you in the face or on the lap. Once we accepted the fact that we were going to be dirty, we began to celebrate our layer of dirt as a badge of honor. It was during this leg that we did run into an issue – an unfortunately-placed rock on the trail was at the wrong spot at the wrong time as we came over a rise, and our left-front wheel decided to keep going down the road for a hundred yards while its hub remained with us on the buggy. That was the first of what would be just two tire failures among hundreds of miles of extreme driving by dozens of journalists who think they’re better drivers than they actually are. (It’s hard to blame a tire for being cut when the wheel it’s attached to breaks. The other tire failure occurred when a car slid laterally into a sharp rock that cut the soft part of the sidewall.) After a few minutes of suspension repair and wheel replacement, our buggy was back on the road. Following lunch, we hit the trail again, and almost immediately after leaving, we were walloped by huge amounts of rain. The occasional mud puddle was replaced by what amounted to driving through solid rain, with our plexiglass helmet visors being covered by muddy, gritty water, waves of water soaking us to the bone, and trails turning into impassible rivers. Yet, we trudged on. At one point, we wound up off trail (despite having in-dash GPS) and we were driving across a muddy plain covered by several inches of water – yet, the KO2s managed to pull the car through to higher ground. We didn’t do anything foolish with rushing water, but it was impossible to avoid it. The video below was taken by my co-driver (you can read his own review of the tire here). We reached our destination for the day, the legendary Mike’s Sky Ranch, and immediately upon arrival, I was handed a beer (still seated in the passenger seat!). After unbelting, but before the shower I so craved, I received a rock crawling demonstration on the KO2 tires by Lance Clifford, founder of Pirate4x4.com in his heavily modified Jeep Wrangler Rubicon. The rock crawling Wrangler handled table-sized boulders with ease, and of course, the tires held up just fine. After a shower and dry clothes (but sadly, not dry sneakers), I felt like a million bucks. 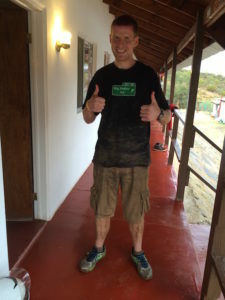 The flow of muddy water off of my body and off of my dirty clothes when I rinsed them was priceless. I have never been so dirty in my life, but never again will I probably experience something like this. We had a steak dinner, an open bar, and watched a movie under the (cloudy) stars about the BFG Baja race team. I headed to my room (shared with two other participants) just before 11:00 when the generators are shut down and the ranch goes dark. Day two began with a traditional Mexican breakfast at Mike’s. After the prior day’s dousing, we dreaded two things – more rain, and having to sit on saturated seats. The skies weren’t looking great, but the pit crew washed the worst of a considerable mud coating off of the BC cars and fitted garbage bags on the seats to keep our butts as dry as possible. We departed, and found absolutely perfect trail conditions – not too dry (which makes too much dust) and not too wet (which makes too much mud and ends up on our clothing). We stayed mostly clean throughout the rest of our time in the BC car. After lunch along the Pacific Ocean, we climbed into the Ford Raptors. The Raptors were twice as powerful as the BC cars, but also twice as heavy. The route we drove the Raptors on highlighted the KO2s on-road capabilities. Driving down the highway at 55 miles per hour (just under 100 km/h), there was absolutely zero tire noise. The KO2s were far more civilized on the highway than I anticipated. 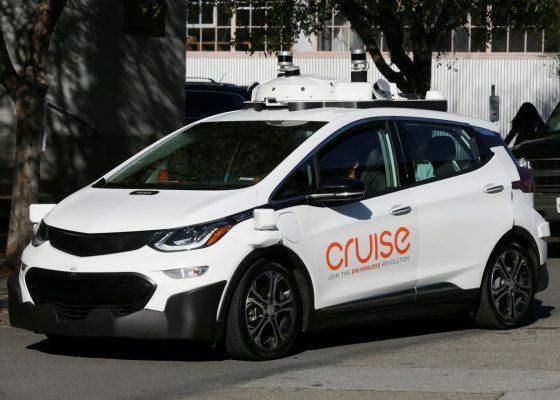 They also tracked very well, showing that they are tires capable indeed of driving in all terrains, including the one where they’re likely to spend the majority of their time – paved roads and parking lots. 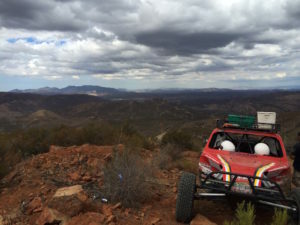 I left Baja grateful for the opportunity to pretend I was a legitimate off-road racer, even if I was only doing a third of the Baja 1000 (we traveled about 300 miles of the course; the 2013 race was 883 miles) and doing so at a third of the speed of the real drivers. Bryce Menzies averaged 50.56 miles per hour over the 447.86-mile Baja 500. I don’t have that kind of average speed commuting to work on highways, much less on dirt roads, on cliffs with no guardrails, and with other desert hazards. 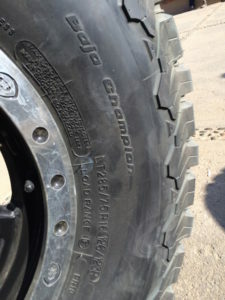 I also left Baja impressed by the capabilities of the BFGoodrich KO2 All-Terrain T/A Tires. 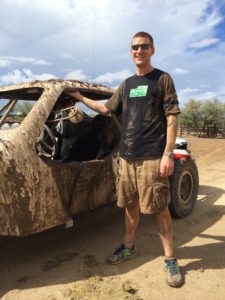 Each tire has “Baja Champion” embossed on the sidewall, and after what we threw at those tires, only to have them escape nearly unscathed – saying nothing of the mud and water conditions that they pulled me out of – they were incredible. If you are an occasional off-roader and want tires that can handle probably the toughest conditions that you would dare throw your own vehicle at, I recommend looking into the KO2. They will be available in 12 sizes starting in November 2014, with an additional 49 sizes becoming available during 2015. The 61 sizes that the KO2 will be available in exceed the 53 that its predecessor, the KO, was available in. Sizes at launch will be primarily higher-volume fitments such as domestic full-size pickups. Click here for the PDF of the first few dozen sizes available. BFGoodrich provided airfare, lodging, meals, and parking reimbursement in order for us to travel to Baja and experience the KO2. BFGoodrich also provided various novelty items such as a tee shirt, hoodie, socks, USB phone charger, and flashlight.